We eat a Big Fat Salad at least once a week for supper. It’s Angel Baby’s favorite meal in the universe. The apple don’t fall far from the tree… whenever we’re rushed and I serve up something like hot dogs, she always says, “UUGGGHHH, I wanted REAL food. She’s seven. How awesome is that?? Anyway, sometimes I like to make fresh, hot, chewy, crusty croutons to go with our salad. They’re sooooo good and sooooo easy and sooooo much better than store-bought. Here’s what you do… any time you have leftover buns or rolls (usually hamburger and hot dog buns at my house), just throw them in the freezer. They are perfect for croutons! 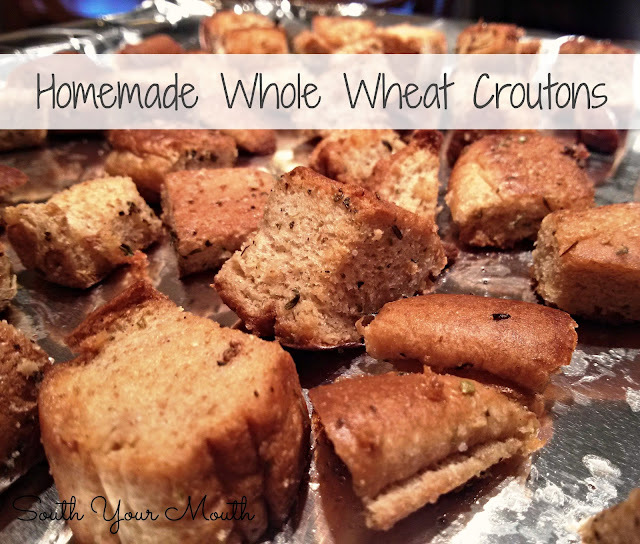 And since I almost always buy whole wheat buns, we get to have whole wheat croutons – holla! Also? Frozen buns are super easy to cut into crisp little cubes. Add bread cubes to a large bowl then add salt, garlic and Italian seasoning; toss to evenly distribute seasoning throughout bread cubes. Drizzle melted butter over bread cubes and toss to coat (I use my hands). Arrange bread cubes on a large baking sheet and bake at 375 degrees for approximately 12-15 minutes. I like mine crusty on the outside but kinda chewy on the inside so I don’t cook mine as long as some might prefer. Just take a look and take a taste and cook them until you get them how you like them (how’s that for a scientific recipe??? hahaaaaa).